So lovelies, I was channeling my inner, lanky, pouty-faced runway model the other day (her name is Natasha, from Russia) and was wondering what she would wear to prowl the alleys of Reno. This is what I came up with. Now, having said that, you all probably think I hear voices. Wow, this outfit is amazing! I am loving the lace - the entire ensemble is perfection! Ack! I LOVE the denim + lace!!! You look unbelievably cool...probably too cool for me...LOVE IT! 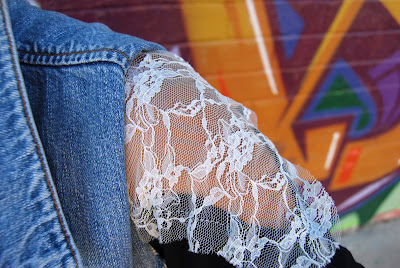 love the lace and jean jacket. I love love love the lace you have going on here! So creative to wear it backwards! :] And I'm digging the boots! I've been wanting a pair of lace up ones myself!